If you have been to Hong Kong, you probably have seen this quite a lot in their Cha Chan Tang. Hong Kong's soy sauce noodles, a very simple but delicious breakfast that HKers eat every morning. Yes, I envy much! So what to do when the craves come? Head to then kitchen then! 1. Cook the egg noodles in a pot of boiling water, drain noodles and set aside. 4. Toss in the vegetables and the rest of the ingredients (except beansprouts and chives), add some water while stirring continuously. 7. Toss is beansprouts and chives finally. 8. Add 2 tablespoons of dark soy sauce and give a quick mix. 9. Cover and let it cook for about a minute before serving. PS: The Korean Ginseng Chicken Soup recipe will be up soon! Sorry for the delay! Hey Lirong! This + a bowl of pei dan congee is fantastic for breakfast! 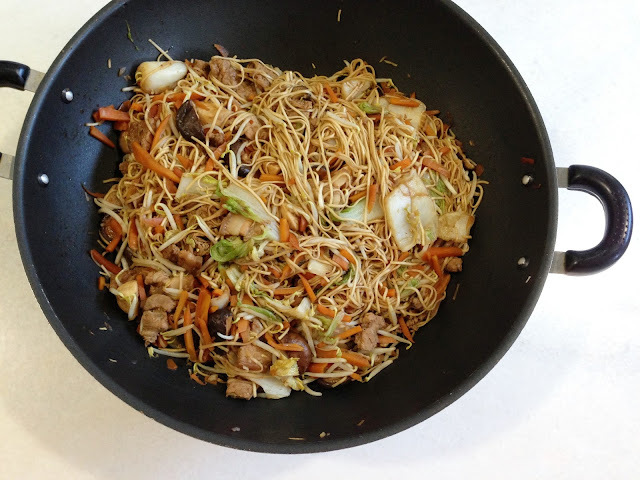 You could try add a few dashes of light soy sauce into the wok *before* adding water..the sizzle makes the soy sauce more fragrant and the dish has more wok hei =) It's what Dad and I usually do..hehe. And fen chang!! I miss HK so much!!! T.T haha! Really? Thanks! I will try that next time! Hehe!